Internationally recognized anti-bullying expert, Dr. Haber has now expanded his proven effective programs to include hazing and bullying in the armed forces. Today’s military requires teamwork and trust, Dr. Haber’s focus on communication and cooperation supports mission readiness and success. Hazing and bullying behaviors prevent the formation of cohesive teams. Members of the Air Force, Army, Coast Guard, Marine Corp., and Navy of any rank can benefit from Dr. Haber skill-building workshops. The Department of Defense has increased its study of bullying and hazing incidents across all branches of the armed forces. The most important thing military leadership can do to combat this dangerous and divisive behavior is to clearly convey that it is unacceptable and detrimental to the mission. Dr. Haber’s workshops demonstrate a strong stand against bullying and hazing both to the members of your unit and to military leadership. Dr. Haber imparts skills and builds teams focused on collaboration and mission success, not conflict and competition for acceptance. Bullying and hazing distract from work and hamper productivity and mission readiness. Dr. Haber makes communication, cooperation, and mutual respect a habitual response resulting in cohesive and responsive teams. Experience the benefits of enhanced productivity and improved preparation from a bullying and hazing free work environment. Dr. Haber’s research-backed training methods help service members and their families cope with bullying and hazing. Dr. Haber can walk your group through the historical use of bullying and hazing and how that is no longer compatible with modern military needs. He demonstrates proven methods for bullying and hazing prevention, while teaching your service members how to identify bullying or hazing red flags. Constructive communication and teambuilding methods are taught. Warrior mentality in the modern military context is broken down and explained, along with teamwork, communication and trust building. The connections between bullying and hazing and depression, PTSD, and suicide are addressed. 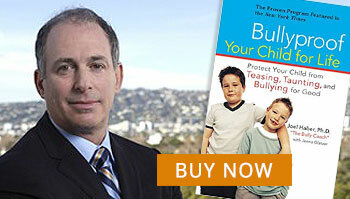 Dr. Haber offers meaningful, measurable solutions to bullying and hazing issues. Dr. Haber offers a number of services to fit your needs. Workshops are available in half-day, full-day or can be spread across multiple sessions. Services can be performed on-site or via video teleconferencing.